It is an instruction book on lots of different braids. 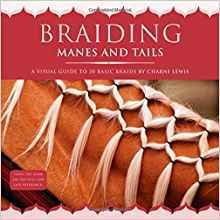 I show (hunter/jumper) so I wanted to learn how to braid my horse Chance's mane and tail. It has instructions on dressage, jumping, and Western braids, as well as braids that are good for helping the mane and tail grow. The only problem is, Chance's real owner (I lease, as she doesn't ride him) cut his mane really really short as soon as I got the book. Note from Sydney: You can get it from Amazon, just click on the image on this page.